Well, this seems to be the same size as the other "reasonably sized pics", and is the best of a session of painting again. !!!! Recycle them??? O_O Ghah! I mean, from the picture, those are lovely! Minor Imperfections Are Part of the Natural Beauty of the Finished Piece. 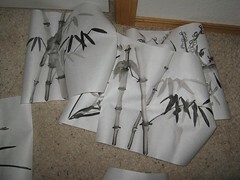 If it works for leather pants, it's gotta work for painted bamboo, right? Stunning. I gasped when I saw it. Such a nice thing to see! *_* you just keep getting better and better! How fast do you have to work? To keep the wet on wet working, I pretty much do one of these in less than half an hour. The orchids are like five or ten minutes once I get my courage up and just do them. There's really no fiddling possible. 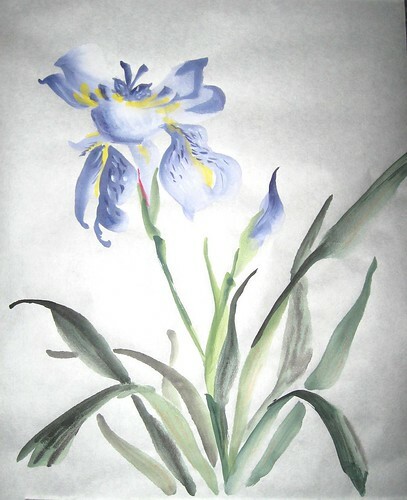 *laughs* I fiddled the top right petal on the iris and it shows... badly. Ah well. 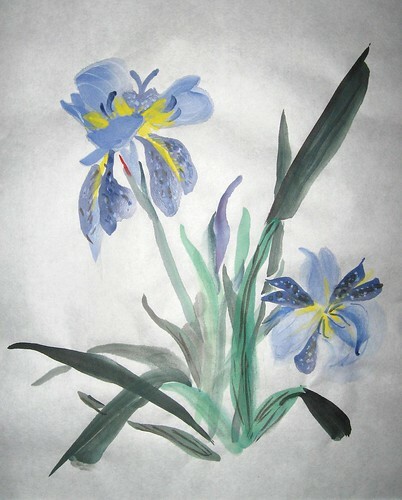 Each of the petals on the irises are two strokes. The leaves are each one stroke for each shade. I can then go over things with the dots and lines for detailing, but that's about it. I love all of the paintings. They are quite beautiful. They're all beautiful, but something about the second black and white orchid speaks to me. I think I like the spray of leaves and blossom. Mmmmhmm... I really enjoy that one for those reasons. Thank you! 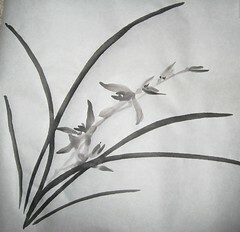 I want to learn how to do the whole sprays of flowers consistently. I did a whole page of blossoms in the throw-aways so I could do these. 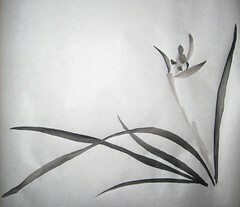 It's hard getting the shading from dark to light on the petals... as it requires a really fast, accurate stroke as the gray is actually watered-down ink. And the extra water makes it nigh on impossible to control. Oh these are so much more than just 'pleasant'. They're so lovely and serene! And the iris blooms are gorgeous.